You are here: Home » MEDIA » Films » The Golem (2018) (a film review by Mark R. Leeper). 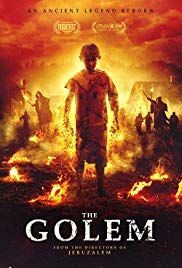 The Golem (2018) (a film review by Mark R. Leeper). ‘The Golem’ is one of the rare horror films built around that folkloric creature, the golem. As with most golem tales, the golem is an animated statue used for defence. But in this film the golem plot is upstaged by the view of life in 1673 in an Eastern European shtetl (ie a small Jewish village) setting. The Jews are persecuted and murdered until one starts thinking that making a golem is required for justice. Directors: the Israeli Paz Brothers (Doron and Yoav); Writer: Ariel Cohen. Rating: +2 (-4 to +4) or 7/10. I knew from an early age the difference between reality and fantasy. I quickly decided that fantasy was a lot more fun. My imagination was full of werewolves, vampires, and humans constructed from reclaimed parts. But I had never heard of a golem until I was about bar mitzvah age. I was entranced. ‘Wow! A Jewish monster!’ I explored everything I could get my hands on that involved golems. For the benefit of the uninitiated, a pious person can sculpt a clay figure of a human and then, if he knows God’s mystical formula and it is a well-guarded secret, he can use the formula to bring the sculpture to life. In Jewish folklore, golems can be used as super-heroes or, with huge strength, they can also be deadly monsters. Some golem stories have plots that are very like that of ‘The Sorcerer’s Apprentice’. Others are much more like Frankenstein monsters. Golem lore may have inspired both stories. The Paz Brothers’ film ‘The Golem’ has right the look and feel of a small Jewish shtetl in 17th century Lithuania. It was a very bad time for the Jews but, then, rarely has it not been a bad time for Jews. There is a plague ravaging most of the region but not the isolated Jewish shtetl where the story is set. The main character is Hanna, who wants an education in Jewish mysticism. She still mourns for her son killed seven years previously and wants to use forbidden knowledge to resurrect the son. The local gentiles blame the Jews for the plague. Murdering Jews has become the local popular sport and a sort of religious duty. One non-Jew has come to the shtetl in the hope that they can cure his plague-ridden daughter but, in return for the restraint of killing only Hanna’s sister and one other person, they offer him a place to stay away from the sickness. The murderous visitor, Vladimir, tells the Jews that they seem to be able to avoid the plague and if they let his daughter die he will have revenge on them all. Bitter from her experiences, Hanna has immersed herself in mystical books, learning how to use them for power. Hanna is warned by others in the shtetl that if she reads the many texts she wants she could lose her mind. The style of the writing is slow and deliberate. The Paz Brothers previously wrote the zombie film ‘Jeruzalam’ co-directed here. ‘The Golem’ is a big improvement, but it still has an undeniable drag to it at times. It has some of the tone of The Dybbuk (1938) or The Vvitch (2015). Bloody violence is mostly kept off-screen but toward the end it is used more freely. The plot of ‘The Golem’ runs parallel to that of ‘The Golem Of Prague’. The depiction of the golem is unusual. But he is wet biology inside and is portrayed as a human covered with mud in his earlier scenes and he has other strange powers not usually associated with golems. This makes it at once a good movie about a golem and a not-so-good golem movie. It will be interesting to see if horror film fans embrace it in general. Overall, I rate it +2 on the -4 to +4 scale or 7/10. « 2001: An Odyssey In Words edited by Ian Whates and Tom Hunter (book review).